The reality of life is that everything changes. Some things we have control over, and some things are forced on us, but what is never forced on us is what we choose to do when faced with change, and those choices are really what will matter. Change is typically hard and unsettling, and making choices is equally so, however taking action – making a choice, really gives back that sense of purpose, accountability and a level of control over our lives that many of us need. Many people every day are faced with job loss, home loss, family loss, and as a result may feel anger, fear, shame, isolation, helpless and hopeless. Those feelings are a natural and necessary part of the cycle of change. The family members I was talking to knew all of this because they had been through several major life impacting changes, and although they are not experts on the theory of Change, they are experts on Change through experience. Their perspective gave some food for thought. We need to expect change – not be surprised by it. We don’t know what form changes will come to us in, but let’s be clear; exactly what is now, will not be in the future. 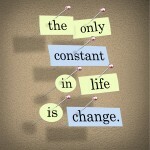 We must accept change as a natural course of life. It’s not new or exclusive to you. We are born, we grow, we age, we die. Summer, Autumn, Winter, Spring. We are unconsciously in a constant cycle of change and we accept that we have no control over ageing/death, the seasons/weather. We prepare as a matter of course: pension plans, warm clothes, heat. We should reflect inwardly as a way to prepare as well as we can for whatever will come our way. You can never truly imagine what life will be like after something big changes, but you can be aware that you will somehow be different than you are now. Given your personality, what you know about yourself and how you typically deal with things, you’ll have an idea of how you may react to a certain set of circumstances, a death, job loss, new project, new boss, new baby, a location move. Reflect on how you think you’ll feel and how to make it the best it can be. Depending on your perspective, things are perceived as good or bad. Sometimes ’good’ things we have wished for may happen and we may then wish they never happened because we never anticipated the ‘bad’ consequences (e.g. The Lottery winner that couldn’t deal with the fame and constant letters). Sometimes ‘bad’ things happen and a new exciting ‘good’ thing is the silver lining to the cloud. Think about things that could happen and pose the question “what would I do?” You don’t have to be excessive in this but it’s not a bad idea to know where you’d start if x,y,z happened. At the end of the day, adaptability is core. Our ability to quickly adapt and pick a direction to take, in the midst of the constant flow of choices that are presented to us in constantly changing circumstances will be the difference to us thriving in, or being a victim of change.